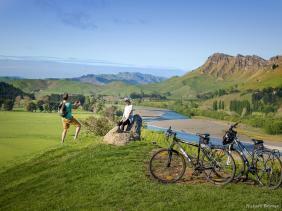 Explore the beauty of Hawke’s Bay and the truly delectable food that awaits on a cycle gastronomy tour like no other. Josh and Juliet will open doors to delicatessens and food producers not readily accessible to the public as weekend attendees discover the best of local Hawkes’ Bay food and wine through the eyes and palates of the experts. Food, wine and healthy living unite in New Zealand at the inaugural Tour de Chef weekend at The Farm at Cape Kidnappers, bringing together Michelin star chef Josh Emett (of Rata, Madam Woo and Claridges fame), Hawke’s Bay foodie and cheese expert extraordinaire Juliet Harbutt and Craggy Range Wines. Spend Saturday cycling through magical Hawke’s Bay at a relaxed pace with Josh and Juliet as guides, discovering artisan food, award-winning wine, local producers and stunning landscapes. Saturday night's dinner will be a special highlight with matched wines by Craggy Range Wines, presented by Director of family-owned winery Mary Jeanne Peabody Hutchinson. Craggy Range, situated in the shadow of Te Mata Peak in the premium wine growing area of Hawke’s Bay, was recently named #1 Winery in NZ in 2017 by Bob Campbell, MW in his annual Golden Grapes Award, recognising their outstanding contribution to the New Zealand wine industry and the people of New Zealand. With a variety of bikes, support vehicles and e-bikes available, this event can cater to riders of all levels of experience - from beginner to avid.